Only in Boulder would someone ask if he can bring a climbing crash pad on a shuttle bus. Yes, the bus allows crash pads. And bikes. And dogs. Welcome to Chautauqua. Beginning this summer, the City of Boulder has started offering a shuttle to its most popular mountain park as well as installing pay parking in its always crowded lots. Both measures sprung from the city’s Park to Park pilot program, which ran on weekends June through August to test ways to ease traffic and parking congestion around Chautauqua. Boulder’s iconic park at the base of the Flatirons is buckling under a crush of visitors. Between August and November 2015, the city counted 300,000 visitors to the Chautauqua Meadow and Enchanted Mesa areas. That’s double from 10 years ago and more than some national parks. Add visitation to Chautauqua’s greendining hall, and auditorium, and it starts to resemble an ant farm bulging at the seams. City officials stress that the intent isn’t to reduce visitation but to manage access to protect the area’s integrity. “Our block of 6th between Cascade and Aurora was jammed with cars of hikers who are willing to walk one block to avoid paying for parking,” an irked resident emailed. The free shuttle proved popular, with 2,300 people taking the ride on some days. 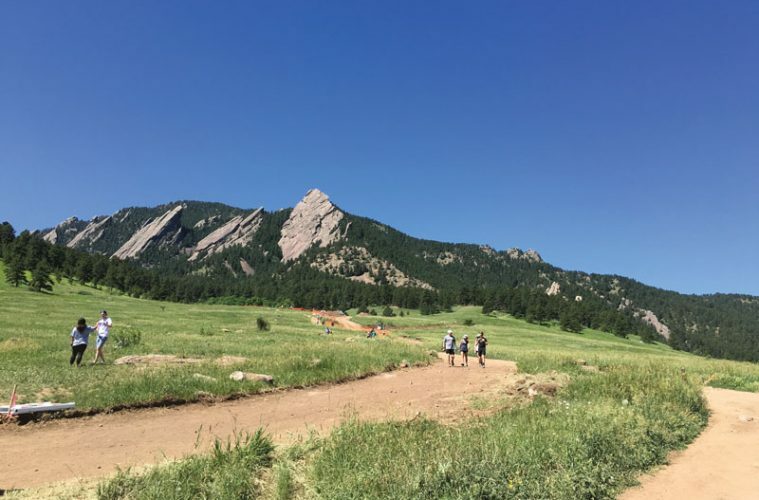 The City of Boulder’s Open Space and Mountain Parks Department (OSMP) also has its fingers in the pudding since it manages Chautauqua open space trails, which, no surprise, see heavy use. “Visitor use can affect the trail, especially on some of the older trails,” said Phil Yates, a OSMP spokesperson. Trail damage often occurs when people walk around muddy areas, so OSMP is realigning the Chautauqua Trail to improve drainage and trail tread.